Using a treadmill indoors is a great way to exercise - it simulates walking or running outdoors, but without the danger of tripping, the nuisance of traffic, and the problems associated with adverse weather conditions. It is an aerobic exercise, with benefits including cardiorespiratory fitness, fat loss and muscle toning. All treadmills have adjustable speed (most also have adjustable incline), and many have programmes to keep the training interesting. For those with sensitive joints, fast walking is preferable to running, and the intensity can be increased by inclining the treadmill deck. This simulates uphill training, and greatly reduces the "shock effect" coming up through the feet. We recommend that a good pair of trainers be worn, and if you intend to run regularly, look for a machine with good quality cushioning in the deck, or one with an orthopaedic belt. If you have any doubts, consider cross trainers, as these have lower impact on the joints and the added benefit of a more intense upper body workout. Hire a treadmill to see if it works for your fitness goals. Upright Cycles have a "sitting up" position, with a comfortable saddle and adjustment for height and reach. Most have programmes to keep the training interesting, and some have step-through frames, making them more suitable for infirm or injured users. Recumbent Cycles have a "sitting-down" position, with a back rest, and therefore are recommended for those who are infirm, injured or suffering with back pain. 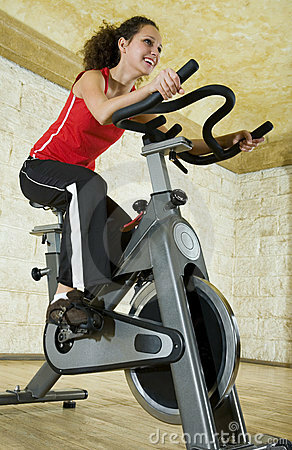 Spinning (or Studio) Cycles simulate racing cycling indoors. They are designed for more aggressive workouts, so the handlebars are lower, and the saddle is smaller. This enables the user to ride "off the saddle" and even pedal backwards, thanks to a fixed wheel system. Upper Body Cycles (or UBEs) are specifically designed for training without using the lower body. This makes them ideal for injured athletes, certain disabled users, or anyone wanting to increase upper body endurance. Hire a cycle to see it works for your fitness goals. The main motor housing is at the rear, and the footplates are angled quite acutely. This has the effect of raising the user’s heels to the extent that the calves are not too intensively trained. The main motor housing is at the front, and the footplates are angled less acutely. This results in a more intense workout for the calves, similar to running. 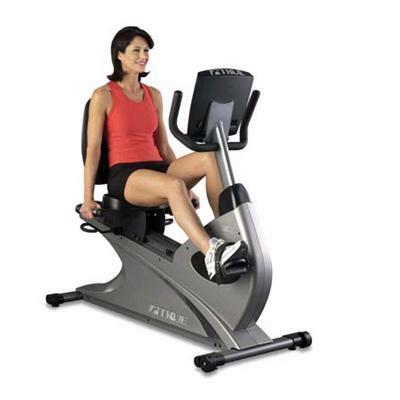 Some domestic front-drive Ellipticals have a space-saving folding mechanism. Although historically these have been less common than rear-drive models, the addition of ramping systems (which allow the user to change the angle of the footplates) have made them more popular. Hire an elliptical to see if it works for your fitness goals. Indoor rowing is a great way to train, although most machines do not simulate rowing a real boat very closely. It involves almost all of the body’s muscles, and is generally low impact, although a healthy back is essential. It is an aerobic exercise, with benefits including cardiorespiratory fitness, fat loss and muscle toning. Apart from specialist "sculling" training machines, the best rowers are those with a centre – pull system, and the ability to change the resistance to suit your fitness level. Very tall users may find the cheaper models do not allow a full range of movement. Some models fold for storage. Hire a rower to see if it works for your fitness goals. Stepping on an indoor machine closely simulates hill walking, and has for many years been used for general fitness training as well as by climbers and walkers. Generally the "knee lift" is greater than on a cross trainer, so caution is required when the knee joints are worn, or painful. It is an aerobic exercise, with benefits including cardiorespiratory fitness, fat loss and muscle toning. The entire leg and buttock area benefit from an intense workout, and since the feet stay in contact with the footplates at all times, there is no joint shock associated with running. Most models have programmes to make the training interesting. Vibration training increases the gravity effect of any load-bearing exercise (ie. a leg squat). The effect of this is that more muscle fibres are employed, and the workout time can be reduced by up to 50%. It is a mostly anaerobic exercise, just like weight training. Benefits include muscle toning, strength gains, increased core stability and some fat loss. There are many other benefits when vibration plates are used in the "stretch/massage" mode – something that the cheaper machines don’t even offer. We advise that you speak to knowledgeable staff (like ours, who are VibroGym qualified) before training with these highly effective machines. Hire a vibration plate to see if it works for your fitness goals. Where space is tight, or where the option to use loose weights is not possible, weight training on a multigym is ideal. The main benefit is that many exercises can be performed safely on a unit that has a compact footprint. Of course, this means that some exercises are less realistic (or have limited motion) compared to individual training machines, but overall they offer a good solution. Always go for a multigym with a cast iron weight stack, as the vinyl ones tend to be less smooth to use. Weight training is known as anaerobic exercise, meaning that the cardiorespiratory benefit is minimal. However, benefits include muscle growth and toning, strength gains, and some fat loss (particularly during longer workouts or "super-set" training). There’s no substitute for weight training when you want to build muscle. In order to maximise the use of "free" weights (ie. dumbbells and barbells), a bench is necessary. It enables lying and sitting in safety when using the weights. Most benches have an adjustable seat for incline or decline, and some have attachments that allow for extra exercises to be performed. Barbell benches have upright bar holders for safety when performing presses. Where space is tight, a folding model is recommended. Weight training is known as anaerobic exercise, meaning that the cardiorespiratory benefit is minimal. However, benefits include muscle growth and toning, strength gains, and some fat loss (particularly during longer workouts or "super-set" training). Whatever exercise you choose, we will do our best to supply the perfect equipment to maximise your training! Call us now, on 01730 825050.